Back in March when I first came to the decision to give this a try, I was feeling supremely confident! I mean, my goal was September… six months away! Well, here I am three months in and at the half way point. Here is a quick synopsis of where things stand. 1) I have felt great on the trail – better than I ever have in fact. This is attributed to several factors: hiking more often, yoga – lots and lots and lots of yoga, filling in the gaps by running and biking around the neighborhood, my surgery results being very positive and losing lots of weight! 2) My pace is still far off where it should be. I am hiking stronger and feeling better than I ever have on the trail (see above), but my pace has been off where it has to be. We’ve had some obstacles (namely – snow, snow and more snow) so I am interested to see where things will be at this summer with clearer trails and fairer weather. The short of it is that I just need to pick it up. No excuses. 3) Maintaining focus on training is very, very hard. Life has a funny way of throwing distractions and roadblocks at you. Many days it is easy to get home and say “Screw it I am not going for that run.” or “I don’t feel like getting out of bed early to go to yoga”. These past several weeks have been especially overflowing with many such distracting stressors which have caused me to fall off the wagon a bit. Despite that frustration, the first step is being aware it is happening. With the completion of a couple of major events and projects in the next couple of weeks, I should be able to get back on track in short order. I’ve got the whole world in my hands! 4) Most importantly, I am still finding that with time on the trail comes a great amount of peace and solace. The mental, physical, psychological and spiritual challenges that come with hiking are only superseded by their rewards. Overdue timelines and missed summits are not raining on this parade. Spending time with my friends, meeting new people and sharing in these incredible outdoor experiences is a reward greater than the journey itself. There is a lot of work ahead of me and I will be spending a lot of time out on the trails this summer, always with the eye on the prize. But I definitely won’t be forgetting to enjoy myself along the way! Three more months to go…. yikes! After a long, very wet day on the trail on Saturday we refueled the mind, body and spirit with some beers and food in a warm, dry pizza joint in Gorham. One our way back Ben and I were talking about doing something a little smaller and easier for Sunday. 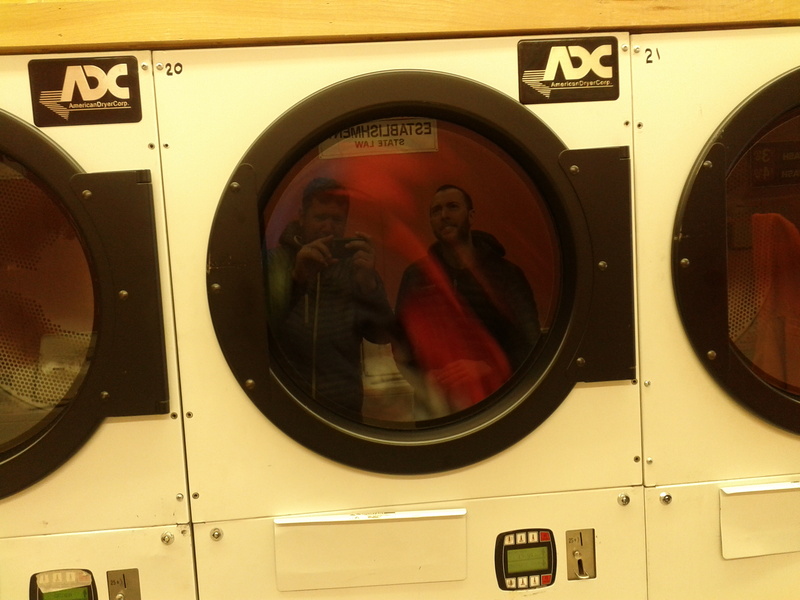 Something that we could sleep in for, hit the laundry mat to dry our clothes and have a chill day on the mountain. And then Trina called to say that she was almost to camp and was ready for an epic hike… I am really glad that Trina ended up coming up! Not only for the joy of her company but because we had a pretty awesome experience on Mt Adams on Sunday. We got up pretty early on Sunday because we knew that we had to hit the laundry mat to dry our clothes. We grabbed some breakfast and coffee at the White Mountain Cafe & Bookstore (rapidly becoming one of my favorite spots in Gorham), picked up our now dry-ish clothes and suited up! The previous night was pretty cold – well into the 30s, dipping into the 20s – and it was evident by the ice and snow coating the trees on the mountains… even down to the lower elevations of around 2500 feet! We headed to the north side of Adams picking up the trail at the Appalachia lot and our trail of choice was the Airline Trail . When hiking the Airline Trail, or on this side of Adams period, you definitely need to pay attention to what you are doing. 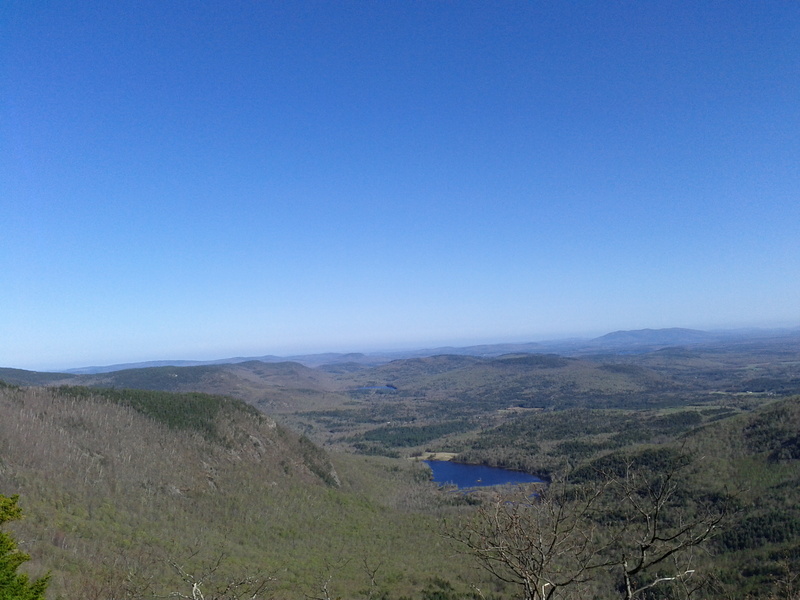 There are many, many trails on this side of the mountain that all intersect managed by the Randolph Mountain Club and the Appalachian Mountain Club. The Airline Trail (an AMC trail) is the shortest route to the summit of Mt. Adams at about 4.3 miles. We knew it was going to be a grind and were wondering what kind of condition the trail would be in after days of rain. As we finished layering up, I put my boots and they were still soaking wet from the day before. What’s more I felt an odd pinching, pain feeling along my right ankle as I walked around. It did not hurt when I put weight on it or jumped from foot to foot so I did not think too much of it. This would later come back to be a foolish decision. Even the lower elevations had snow. SNOW! MEMORIAL DAY WEEKEND! crazy. We hit the trail at 10am and motored on up the lower section of the trail. Ben was setting a brisk pace and we were moving right a long. The trail was muddy and wet but not too bad. Thankfully, the rain had stopped by the time we had started so we felt good about the day ahead of us. Sure enough, at about 2000 feet up, the snow appeared. Not old crusty left over snow… new snow. Fresh snow from the previous night. Much of it was caught up in the canopy which made for some interesting moments when the trees would move in the breeze and you would get pummeled from above by a huge wet snowball. The Airline Trail struck me as similar to the Daniel Webster Trail going up Madison. There was not a section that I would call super steep, but it was a steady ascent always going up and never really leveling off. The higher we climbed – the more snow there was. Eventually the snow was at a point where it had accumulated in the trail and we were stomping through several inches of freshly fallen snow. It was totally surreal! 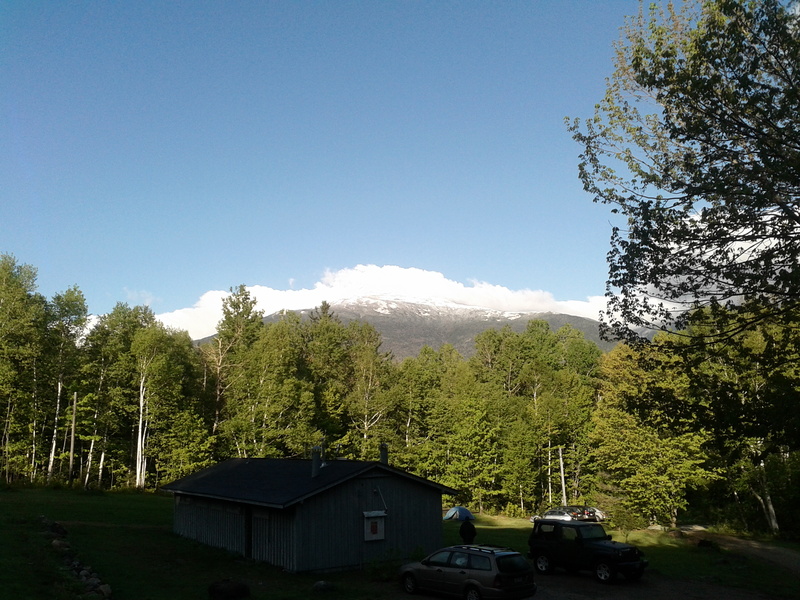 Here we were, the Sunday of Memorial Day Weekend – the unofficial kick off to the summer season – and we were hiking through freshly fallen snow!! It was a trip! The climb kept going and going. And we kept on trudging along. This was pretty ambitious for me, and a nice challenge as well. I have handled the previous hikes I’ve been on pretty well. But this is the first time that I was doing two big hikes on back to back days. Not a lot of mileage relative to previous hikes at only about 7-8 per day, but a lot of gain and a lot of climb. It was also in my head how a year ago, I was at home, in bed laid up recovering from surgery. And that before the surgery, there was no way I could have done trails like this quickly, and certainly not on back to back days with out significant problems with my legs. But here I was, moving along like a champ in the best shape I have been in for a long time and feeling the best that I have felt in a long time on the trail. I was amped up! As we got higher, the snow got deeper. All in all the mountains received about 6-8″ of fresh snow the previous night. And we were in the thick of it! Looking around, the only way that you could tell it was not the middle of February is because the temperature was not 50 degrees colder. As we were moving along, the biggest problem that I ran into was that my feet were soaked. On the previous day’s rain hike. i had soaked through my rain pants and water had run down my leg and into my boots soaking the insulation and padding. Not only did this make my boots weigh about 93 lbs each, but it also meant my feet would be wet all day long. And when trudging through snow, that meant that my feet would be cold too. Cold + Wet is not a good combination ever – especially with your feet! Once again, as we did the day before, we had constant discussion about the status for each of us. Tired, hungry, thirsty, cold, wet, sore, chilly, etc. All these factors were discussed as we got closer to the Alpine Zone. Once above treeline, we knew that the conditions would not be favorable. We could hear the wind blowing above us and even though it was not raining, the clouds were very low and obscuring the ridge lines ahead of us which mean low visibility. We suited up again with new layers right before we broke through tree line. We also decided that our immediate goal would the junction with Chemin des Dames at the top of King Ravine. At that point we would assess trail conditions, weather, time and how we were feeling and figure out where to go from there. Once we broke through the treeline the winds were immediately whipping us in the face. With the winds, was sleet – and plenty of it! 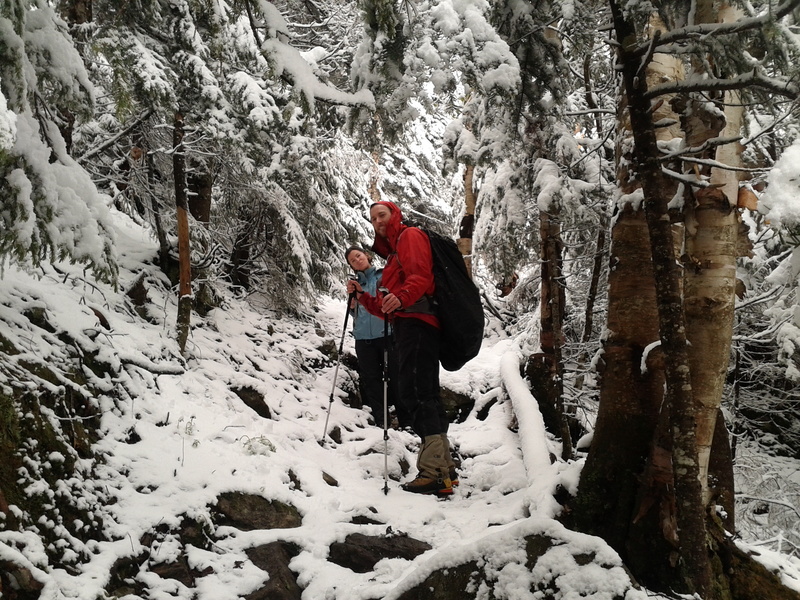 We moved pretty quickly, the snow filling in the gaps of the rocks making it easy to scamper over the trail. Every now and then we would duck down behind some rocks for a breather, but we finally made it to the junction with the Dames trail. At this point, with near zero visibility and again with lack of proper gear (face shields and better gloves), plus with my feet being soaking wet and legitimately cold, we opted to turn back around. It was another mile and 800 feet to the summit but with the conditions that were on the mountain, the prudent thing was to turn back around. Looking forward towards the direction where the summit is. So, with the summit of Mt Adams buried deep in the clouds behind us, we had a little extra pep in our step as we motored on down the trail. We had visions of dry bunkhouses, hot pizza and delicious beer waiting for us. The only challenge I had was that “pinching” feeling I felt earlier was now full fledged Blister City. I never thought about it, but hiking in the wet boots and socks the day before had rubbed my ankles pretty raw. And then over the course of Sunday it only became worse. To the point where every step I took felt like it was someone taking a cheese grater to my ankles. I had dry socks with me, but with my boots soaking wet they wouldn’t have lasted 10 minutes before I was back in the same position. And, it was not like a traditional blister either. It was the entire skin area around my ankles rubbed raw so even duct tape or athletic tape would not help. I just gritted out and kept my eyes on the prize – pizza and beer. Hindsight being what it is, I should have investigated what that stinging feeling was at the start. Had I known what it was then I would have wrapped my heel in duct tape to prevent the chaffing. Two hikes. Two missed summits. But considering the weather conditions and the fact that we were legitimately winter hiking on Memorial Day Weekend, the experience was amazing. I pushed my gear well beyond it’s limits; I pushed myself on big back to back hikes; I tested myself in crappy weather in some of the most exposed areas in all of New England. And throughout it all, I was joined by good friends and we all came out of it better hikers, if not wetter hikers, for it! 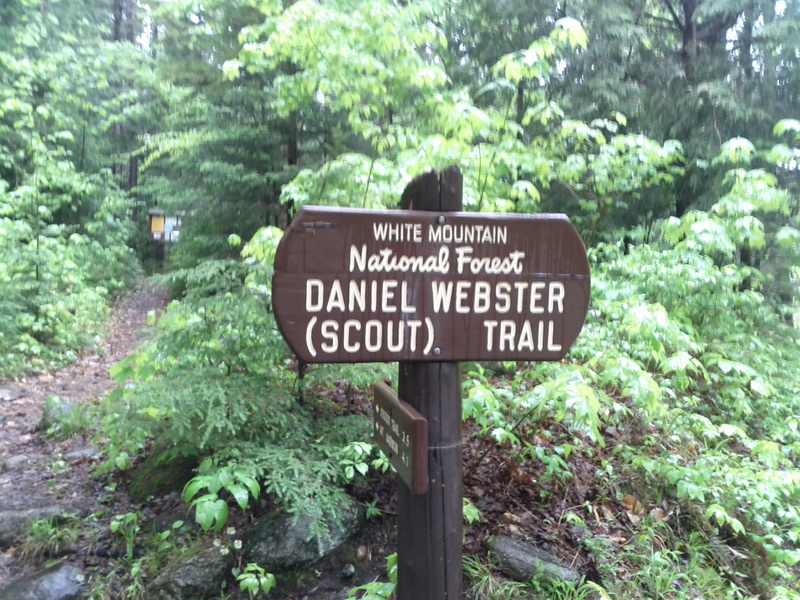 The Daniel Webster Scout Trail was our path up and down. which originated right in the campground and then see how far we could get up. 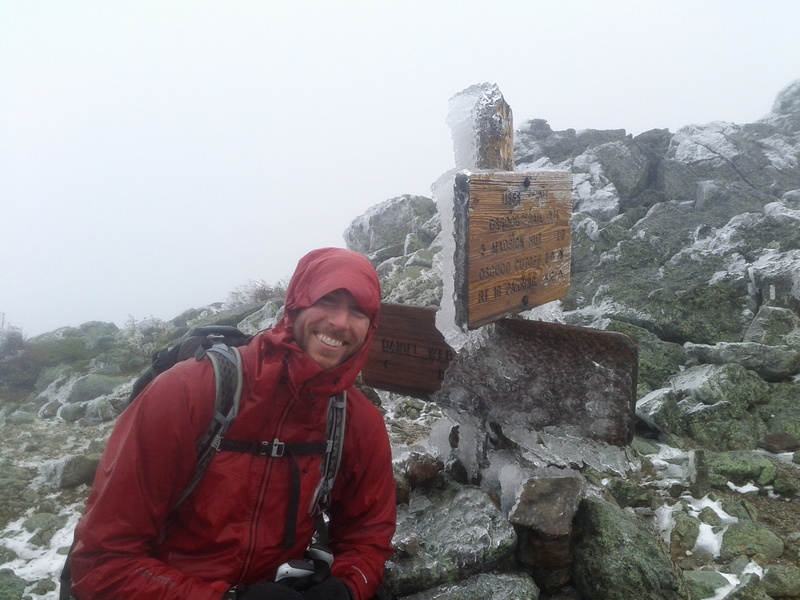 We of course wanted to summit, but it was pouring rain all day and foul weather above tree line in the White Mountains can get a little hairy if you are not careful. 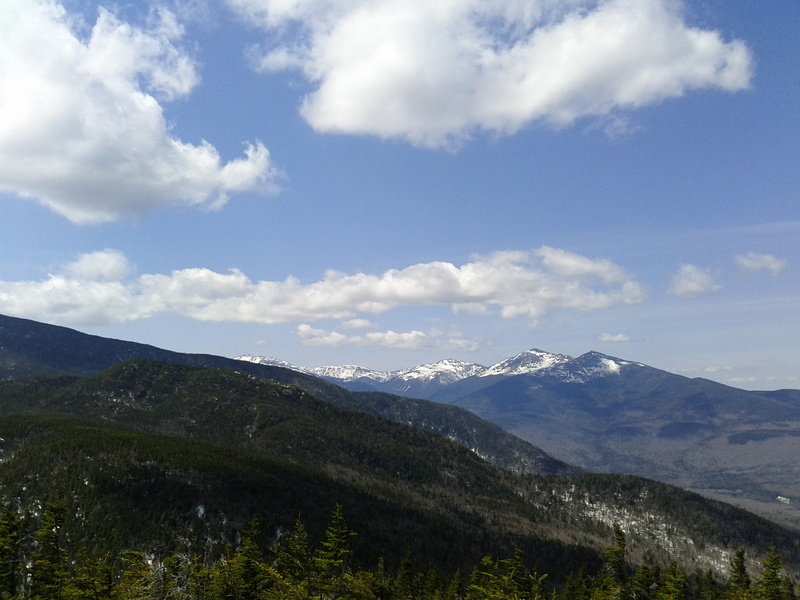 After an unplanned detour to Pinkham Notch to grab some gloves. we headed out hitting the trail head at 10:00 AM. It was raining steadily but the first part of the trail was pretty easy and a moderate grade. Despite the constant rain over the past couple of days, the trail was in pretty good condition. There were a couple of stream crossings but those were pretty easy to manage. by the soft light from the gray clouds above. The canopy also gave us some cover from the rain as well, although there was still plenty of drops coming down. A couple of miles in the forest abruptly changes to an evergreen forest mostly composed of hemlock and spruce. At about the same place, the trail started to climb a bit more and the trail started to get a little more “stream-like” in places where the water was starting to run down the center of the trail. We came across a hiker who was coming down and talked to him for a bit. This was useful on two fronts. 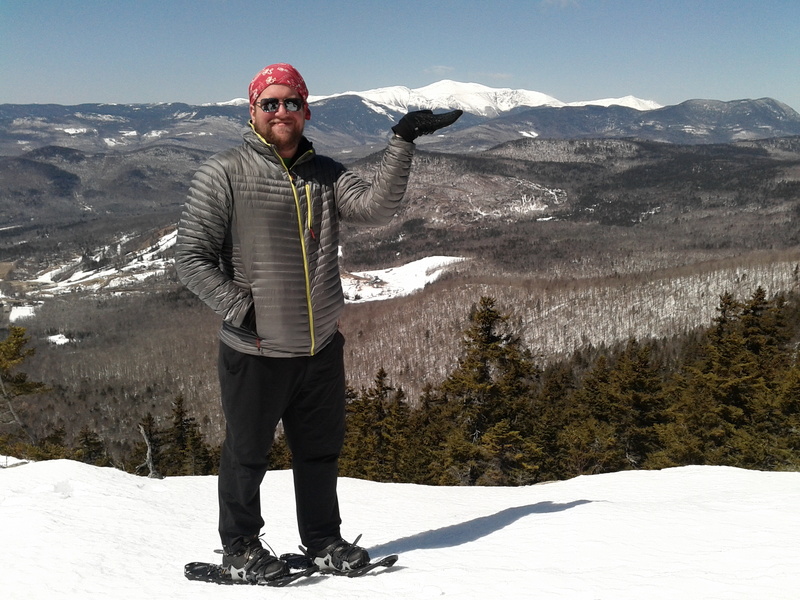 First he gave us some valuable trail intel from what was a head of us – icy at the top (ice!?!?! ), difficult navigating (!!) 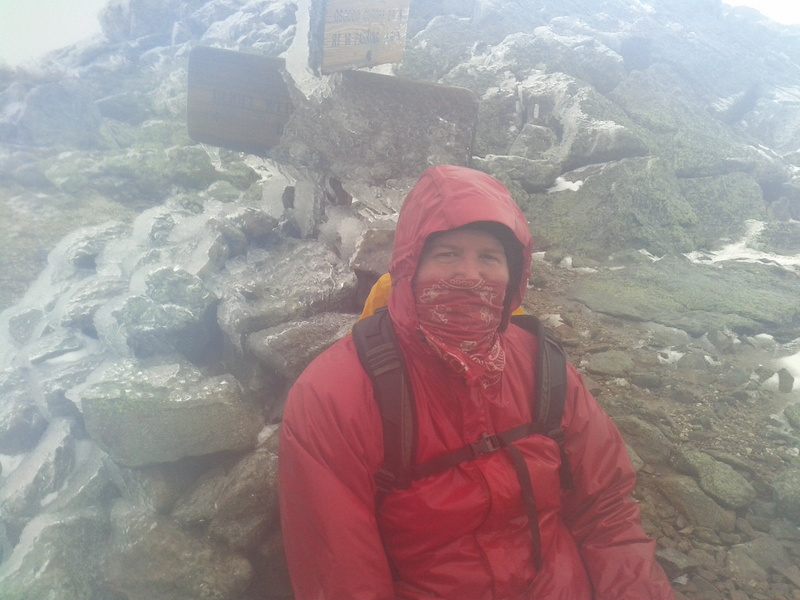 and the sleet blowing in his face made it hard to continue (awesome!). Second, it is always a morale booster to see other people on the trail in these kind of crappy conditions to help reassure yourself that you are not the only idiots on the mountain. We shared info on the trail that we had just come up and then parted ways. The continued to climb steadily until we got to just below the tree line and the start of the Alpine Zone when we stopped to have lunch and throw on our extra layers. The rain had switched to a mix of sleet, snow and rain and we could tell it was going to be windy. There was little visibility around us as the clouds were very low and there was a lot of fog around. We did a quick check to make sure that we were good to go and then busted out of the trees into the boulder fields that cover the top of Madison. Not knowing what the conditions would be like as we got higher up, we wanted our first target to be the Osgood Junction where the Webster and Osgood Trails met which was around 4800′. When we walked out into the bolder field it was pretty intense. No longer under the cover of the trees, the wind was blowing steadily around us and at us – about 20 mph sustained winds. The rain changed over to snow completely which was actually a bonus for us. Because it was windy and no longer properly raining, our outer layers started to dry out! The visibility was pretty poor with only about a 1/4 mile in any direction able to be seen. We focused carefully on the trail ahead of us. With limited visibility and poor weather, it was very easy to get disoriented and loose your direction – particularly in a boulder field where everywhere looks like a trail. As we climbed higher and higher we came across another group of fellows who actually had come all the way from Mt. Adams! They let us know that up on the ridge the wind was blowing really hard and that face masks and traction would be a good idea. Luckily we both had our microspikes with us but we did not have face masks. Cautiously moving forward we decided to make an assessment once we got to the Junction. At the Osgood Junction, there was no visibility and ice was coating everything! a 1/10th of a mile. We were pretty much going from cairn to cairn. Additionally the snow had changed over to sleet which was coming at us sideways and blasting us in the face pretty good. Ben cinched down his visor on his hood and I took my bandanna out and used it as a face mask. The other thing that is critical in these types of conditions is to constantly focus on your surroundings and keep up constant communication. Every 5-10 minutes was a “how you feeling? are you wet? are you cold? where are you wet? what do you think, should we continue?” and so forth. In bad weather, at elevation and being completely exposed you need to be sure that everyone you are hiking with is comfortable with the situation. It is the time to check egos and, as I like to say “not be a hero”. Everyone’s goal is always the summit, but not at the sake of putting each other at risk or in a situation that cannot be handled. Thankfully, Ben and I have known each other and have camped and hiked together for 20 years so that helps make that communication that much easier. One of the cool things about hiking in the alpine zone with low visibility is that it makes you focus on the “now”, one what is immediately in front of you. As you hike on, moving from cairn to cairn the trail reveals itself to you in small pieces. You can’t see what is up ahead, you can’t allow your mind to wander forward and think about what you see. Even though the environment around you is harsh and unforgiving with swirling winds, rain, sleet and snow blasting away at you, you are able to find calmness and focus only on what is in front of you. It is a pretty powerful experience. Finally we got to the top of the ridge line and found ourselves at the Osgood Junction where the weather was the worst we had seen yet! Finally because we were on top of the ridge, we were feeling the full force of the winds and all that came with it. We sought refuge behind a huge pile of rocks and talked through our options. We could continue to the summit of Madison (only a 1/2 mile away), we could turn back and head down the Webster trail or we could take the Osgood Trail back down and connect with some other lower trails to bring us back to the site. We opted to head down the Osgood trail. Not having proper face masks, and our gloves completely soaked through, we felt it a better decision to head back down. While sitting at the top of the ridge, the clouds and fog were whipping right over us! So off we went…. for about 30 yards. We then stopped, being pummeled by winds, and decided that if we went down Osgood we would be on this ridge for a while before making our way back down. If we head back down Webster we knew exactly where we were headed and that shelter from the strong winds and weather was not that far away. So we decided to head back down Webster. As we headed down, the weather had changed over to solid rain and the trail showed it. The upper parts of the trail through the evergreen forests were practically raging rivers! After a brief stop where I made some hot tea to help warm us up, we had to walk through, over and around many small streams and waterfalls that had formed along the center of the trail. It made for some sloppy hiking! It was a long day and slow moving on the boulder field and through the washed out upper sections of the trail. We did the ~8 miles in about 7 hours. Not a great pace but ultimately we had to go with what the mountain gave us. Once back down to camp we stripped off our soaking wet clothes, hung up the outer layers to try and dry and climbed into the tents for a nap and warm up until it was dinner time. Memorial Day is one the most anticipated holidays of the year. In Maine, Memorial Day weekend marks a pivotal turning point in the calendar. It is the unofficial start to summer! Seasonal business open to prepare for the tourist season. The natives start to finally feel confident that they can turn the page from cold, crappy weather and focus on the warmer weather and beaches, barbecues and outdoor adventures to come. It is an exciting time! Traditionally this is a camping weekend for me. It is often spent at a state campground somewhere and exploring the area where we are staying. 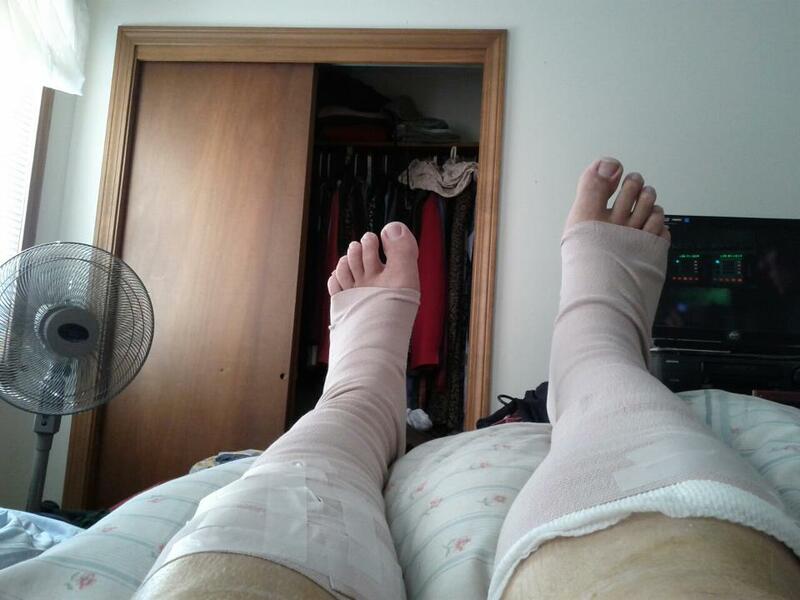 Last year while friends were out barbecuing and camping, hiking, paddling and so forth I was laid up in bed recovering from surgery. 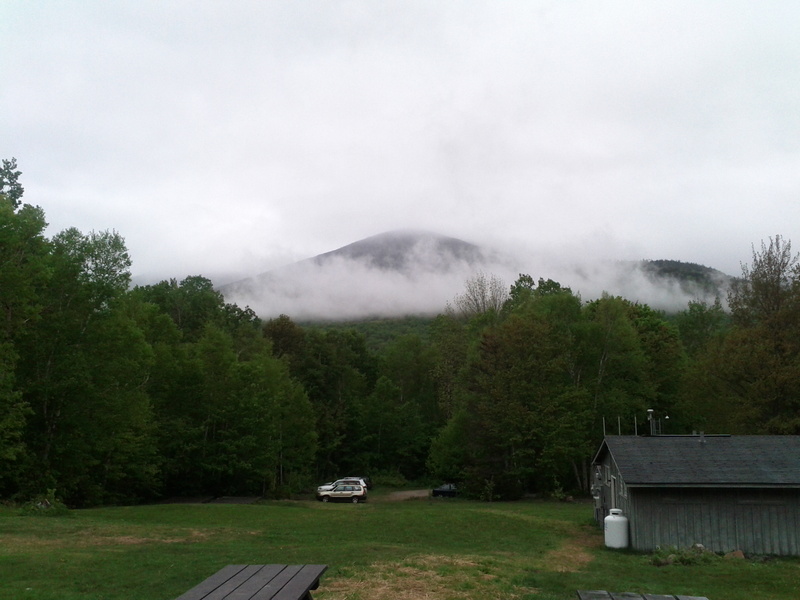 This year, Ben, Alison, Trina and I had our sights on the White Mountains. Alison had to work so she couldn’t play with us on the mountains, but Ben, Trina and I were going to target Mt. Madison on Saturday and Mt. Adams on Sunday. Our base camp: Dolly Copp campground at the base of Mt. Madison off Rt. 16. The biggest challenge for this year’s Memorial Day Weekend: the weather. I am not stranger to poor weather and outdoor adventures. 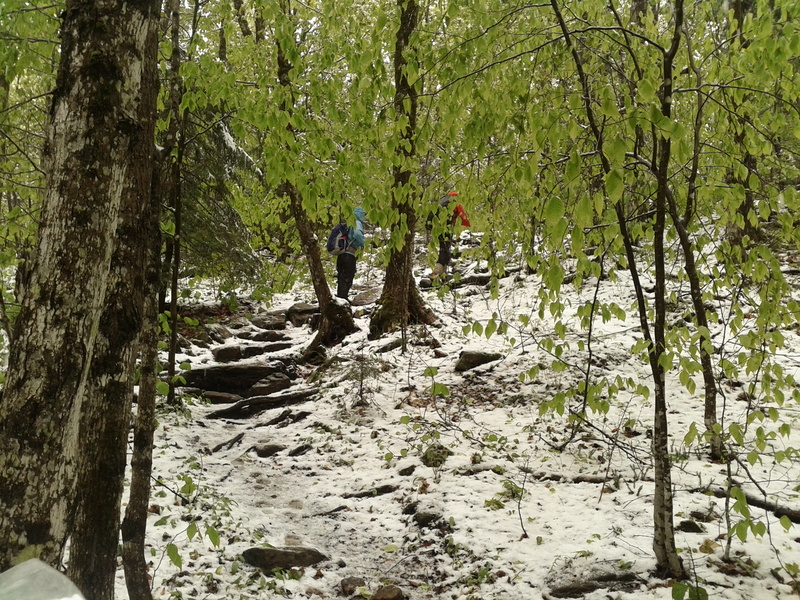 Hiking during all seasons exposes you to some interesting weather events. 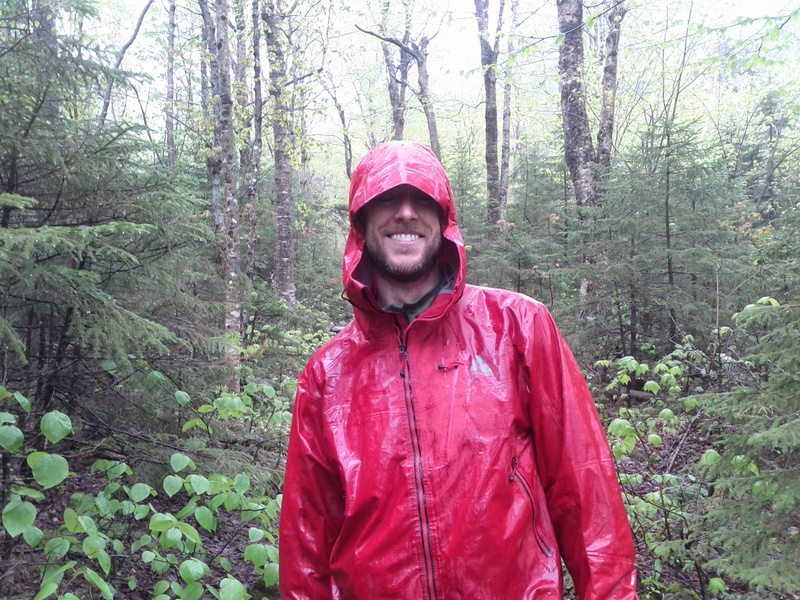 Extreme cold, hot and muggy, thunderstorms, snow storms, bugs, windy… you name it we’ve hiked and camped through it. This year the forecast was calling for rain. And then rain. And then after that some more rain. In addition, it was not going to be particularly warm. Rain, I can deal with. Cold, the same. But when combined it can quickly not become fun. With the long holiday weekend we were planning on camping Friday, Saturday and Sunday nights. The view from the Camp Dodge volunteer camp on Friday night. Rain… Rain… Rain. We got to camp early and set up before the rains came. We then met up with Alison and her colleagues for dinner at the volunteer camp, hung out for a bit and then headed back into the rain for a good night’s sleep. 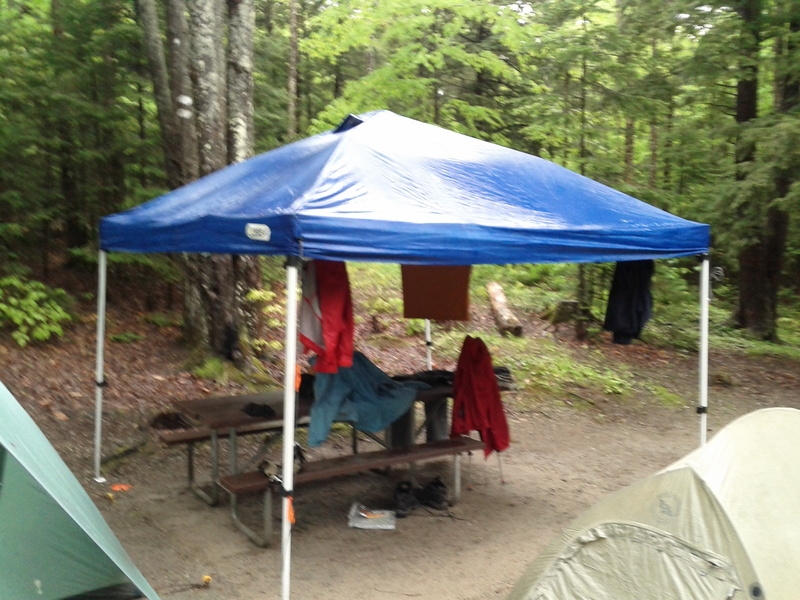 We awoke the following morning greeted by the still constant tapping of rain drops on the tent. Alison headed to work and Ben and I suited up for the trail. Forgetting gloves at home, we were thankfully close enough to Pinkham Notch where we could run over there and hit up their supply store at the AMC Visitor Center. We then high-tailed it back to hit the trail. After our hike we returned to camp in the still constant rain. We were soaked through to the bone and it was pretty cold, in the mid 40s. After a long day of hiking and dealing with the crappy weather all I wanted to do was to take a nap! I quickly got out of my wet clothes trying to hang up what I could to hopefully dry out some. I then put on my dry warm clothes and climbed into my tent and my sleeping bag to warm up. After an hour or so Alison came back from work and got us up an at ’em because it was dinner time! Realizing that starting a fire was futile and not wanting to deal with the cold depressing rain, we left camp and headed into Gorham for some hot food and delicious beer. Even better, the final game of the Bruins vs. Rangers series was on the TV so I got to see the last period of play and the Bs win the series! It was a perfect pick-me-up after a long wet, cold day! On our way back to camp Trina called to say that she was just getting into the Pinkham area (much to our surprise!) and that it was actually snowing back up near Pinkham… SNOW! We got back to our campsite and sure enough there was a layer of wet slush like snow that had accumulated on the outside of my tent. This really made me wonder what we were going to deal with on the trail the next day and if we would wake up to any real accumulation or not. Hanging the clothes up to dry really did not work at all. No big surprise there. The following morning I woke up and was very happy to hear that the rain had stopped! Could this be the day the weather breaks? I was hoping so. What I definitely knew though, was that it was cold and still very damp! I crawled out of my tent to see that, thankfully, there was no snow accumulation. I gave a brief check on the clothes hanging up under the pop-up to find that they were not even close to dry. Alison had to head back to work so Ben, Trina and I got dressed, had a quick snack and then headed out to our hike with a brief stop over at the laundry mat in Gorham so Ben and I could dry our clothes! After we finished our hike, we drove back to the campsite and were blessed with a brief sighting of the sun! I throw the word “glorious” around a lot, but this time… after days in the rain, snow and ice and cold weather chilling us to the bone, the warmth of that sunshine coming down felt truly glorious! It was amazing! We headed back to camp and even though it was Sunday and we had one more night, Alison had invited us to go up and stay at the volunteer camp in the bunk house which I thought was about the greatest thing ever. Normally I would say tough it out and deal with it, but by this time after 49+ hours in the non-stop rain and cold, I was ready to sleep under a dry roof, especially because we knew the sun was not going to last. I can see clearly now that the rains have gone! The following morning, I woke up dry, warm and walked outdoors to find that the only clouds in the sky were covering the summits of the mountains we were on the days before. Memorial Day had finally arrived. And with it, finally that summer-like weather that we were hoping for. Here’s to the adventure that Summer will bring! It has been an amazing week of celebrations and anniversaries. The American Cancer Society turned 100 this week (I am a long time volunteer for the ACS). The 20th anniversary of the Graduation Episode of Saved by the Bell was also this week! Most importantly, as I am looking a long weekend of camping and hiking in the White Mountains for Memorial Day Weekend, I am thankful for two critical events which have had a direct impact on my ability to do what I love most – getting outside and exploring the outdoors and on my way to hiking The Traverse. 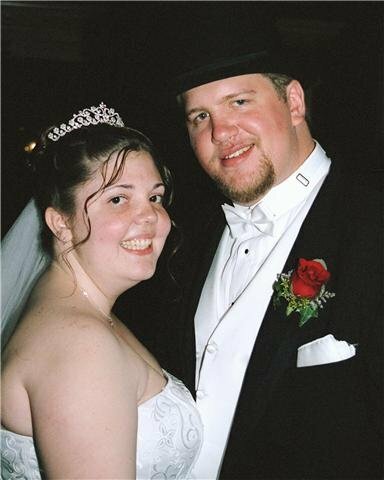 First – my nine year wedding anniversary! Noreen and I have been together for 11 years, pretty much my entire adult life. This year we celebrated our 9th wedding anniversary which is pretty awesome! She has been by my side every step of the way and supported me through all of my adventures. She also encourages me to pursue the activities that I love and has pushed me into things like yoga and getting back into the outdoors. And best of all, whenever I come home, exhausted, tired, sore, muddy, covered in sweat, blood and grime she is always there for a hug and a kiss welcoming me back home. I once described the outdoors as the second great love of my life. Noreen is the first. Happy anniversary to you Nor! Thanks for all of your love, support and encouragement! The second celebration this week… the one year anniversary of my leg surgery! About the three years ago, I was training for the Mothers Day 5k in Portland. While I was running, all of a sudden, my right leg went numb. It felt like it had fallen asleep and was totally dead, barely able to stand on it. I am not normally an alarmist when it comes to my body feeling funny, but this was weird. After ruling a few things out (stretching, new sneakers, etc.) over the next couple of days the symptoms were still happening – I would start to run and could not make it a ¼ mile before my leg would go completely numb. I decided that it was time to see the doctor. This launched a two year odyssey of doctors, specialists, physical therapists, vascular surgeons (I had veins removed from my legs!) all to no avail. Finally I landed in the office of Dr. Asherman at Orthopedic Associates with a diagnosis of Chronic Exertional Compartment Syndrome. The short of is that the muscles in my legs would expand in their compartments creating too much pressure so blood flow would be closed off to the muscle causing it to fatigue and go numb – just like if you sat on your leg and closed off the blood flow. The solution: cut open the leg muscles fascia to expand the compartments which would help reduce the pressure and increase blood flow. We did both legs at the same time, 2 out of 4 of the compartments on each leg. The result: 5 months of rehab and PT with Stephanie Holmes who was at Atlantic Physical Therapy. The ultimate conclusion: one year later I am running, biking and most importantly hiking. I am going on long 10-12 mile hikes with decent vertical; short runs of 2-3 miles; and bike rides all over Greater Portland. And I have been completely symptom free. So here is to those people and events which enable us to do what we all love. And I hope that you enjoy your Memorial Day Weekend! I have been working on a separate post about yoga and the role that it has played in getting me to where I am today. But if it were not for the surgery and amazing rehab with Stephanie, I would not have gotten that far. Funny story – not even one week after I was finally medically cleared to resume full physical activity and PT was finished, I tried to climb Katahdin. I went with friends up Abol and made it to the Table Lands. It was the first real activity in 6 months after laying around all summer doing nothing but PT and I chose Katahdin as my “come back”. Hint: don’t do that. Looking down on Basin Pond from the Basin Rim Trail. On Saturday, we tackled our second consecutive weekend of hiking. This trip was just Ben and myself as we visited an old friend in an old neighborhood – the Royces in Evans Notch. East Royce in particular we’ve been on a couple of times. 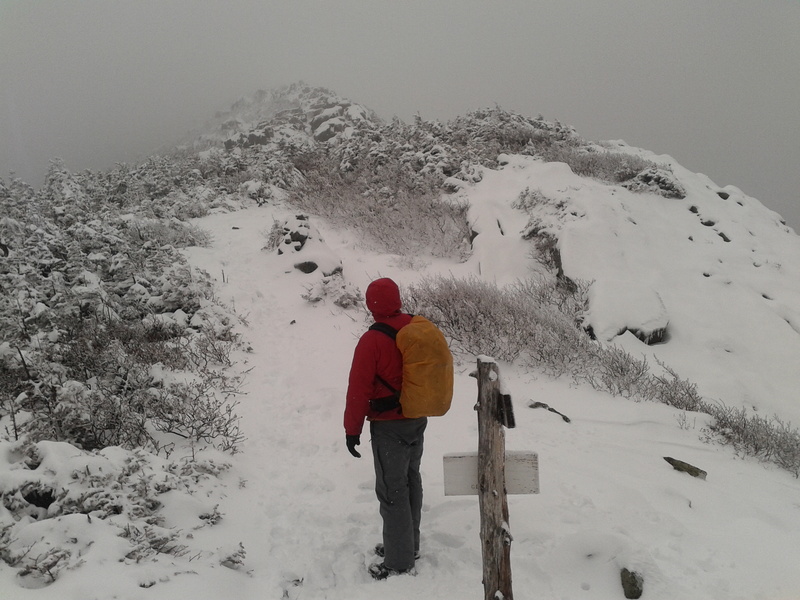 The first time was in winter when we suffered a failed attempt which was due largely to poor planning and execution (hiker’s hint: don’t plan an 8 mile snowshoe for 5 hours of daylight and remember to bring food). We then revisited a couple of years ago over Memorial Day weekend we ended up finishing but that was at the height of my leg issues and it was definitely a struggle. By tackling both East and West Royce we also had a unique hike in that the peak for East Royce is in Maine and the West Royce peak is in New Hampshire. The trail starts nice and flat with a few crosses of the Mad River. Then the climb follows a spine that parallels the Mad River and has a couple of turn outs for some nice waterfall views. The grade was pretty moderate with some decent steep sections. Like last week, we made really strong time up to the connector trail as we broke off towards East Royce. This is also when we first met the snow. After last week’s adventure I was not terribly pleased by this. Even worse than last week however, these trails were not nearly as packed down and the snow was much softer. We hustled as quick as we could, climbing up the final approach to East Royce. We made good time over the first 3.4 miles and 2500′ feet in just under 3 hours. We made good time over the Royce Connector back to the Royce Trail and this is where things started to go sideways. Just about the entire path from the Connector to the peak of West Royce had snow in it. And just about all that snow was the sort of packed, mostly loose post hole material. While it took us less than three hours to go 3.4 miles and 2500′ of gain for the first leg of the hike, this leg took us over 2.5 hours to go down 500 feet and back up 600 feet across 2.4 miles. It was also the first time that I became frustrated at being on the trail. I was leading the way and knew that we were moving slow. Every few steps would result in a post hole that would range from ankle-deep to hip deep. On top of that it was very hard to follow the trail as there were very few blazes and there was a lot of winter blow down which was in the way. As I mentioned in the Moriah report post holing can get you hurt with your knee or ankle getting jacked up. But it also scrapes and bruises your shins and legs and gets your feet soaked. Additionally it is physically exhausting to battle through that much post holing and it definitely took its toll on us. After a brief lunch and visit with some fellow hikers who followed our footsteps up West Royce we headed off and started down the Basin Rim Trail. This trail follows a ridge which looks out over the Basin Pond. This trail had more snow on it, although on the south side of the mountains it was not as deep and easier to move through and over. We also met some pretty decent blow downs which completely obscured the trail. 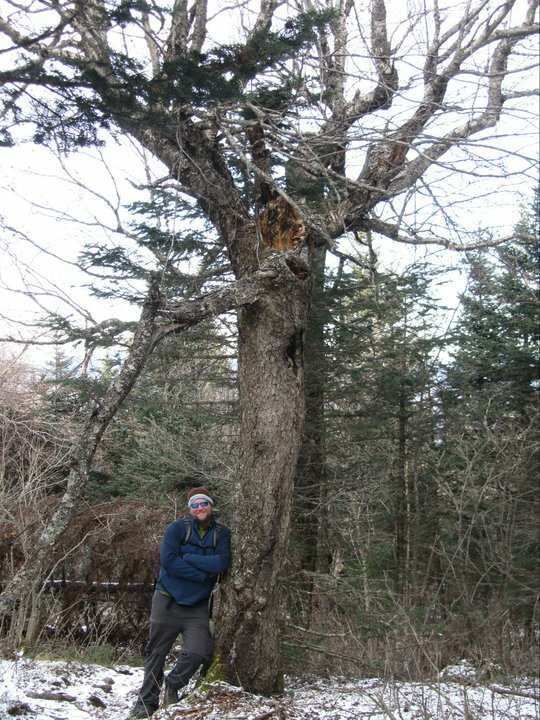 Twice we had to take the packs off, break off branches and crawl through tangles of downed trees. Finally, we got below the snow line and beyond the blow down. But by that point we were battered, bruised, scraped up and exhausted. We mustered up as much as we could and dug deep. Ultimately however, we finished in a little over 9 hours. As we were walking back to the car Ben laughed as he reminded me that the Traverse is more than twice as long, three times the elevation gain and we would have only 4 more hours to complete it. I’ve got a lot of work ahead of me.